WASHINGTON, May 16 2014 (IPS) - As the world remains transfixed by the kidnapping of almost 300 Nigerian girls, there have been increasing calls for international intervention in the effort to rescue them. But what many people don’t know is that the U.S. military has been active in the region for years. With the Iraq War over and the war in Afghanistan slowly ending, it is becoming increasingly apparent – from interviews with generals, recommendations from influential think tanks, and private conversations with military personnel – that Africa is the U.S. military’s next frontier. Rather than the “shock and awe” of Iraq, the military has attempted to put a friendly face on its expedition to Africa. U.S. Africa Command (AFRICOM), the newest of the U.S. military’s six regional commands, has rapidly expanded its presence on the African continent since its establishment at the end of the Bush administration. Emphasising a “3D” approach of “defence, diplomacy, and development,” the White House describes AFRICOM’s charge as coordinating “low-cost, small-footprint operations” throughout the African continent. Yet despite efforts to market AFRICOM as a small operation, recent reports have revealed that the command is “averaging more than a mission a day” on the continent, and has anywhere from “5,000 to 8,000 U.S. military personnel on the ground” at any given point. Rather than the “shock and awe” of Iraq, the military has attempted to put a friendly face on its expedition to Africa. This past March, writing in the New York Times, Eric Schmitt marveled at AFRICOM’s Operation Flintlock, a multinational and multiagency training operation in Niger. Humanitarian and development missions like the ones outlined in Schmitt’s article are at the forefront of AFRICOM’s public relations campaign. But promoting AFRICOM as a humanitarian outfit is misleading at best. To put it simply, these projects are more like a Trojan Horse: dressed up as gifts, they establish points of entry on the continent when and where they may be needed. Under the auspice of development and conflict prevention, AFRICOM regularly undertakes humanitarian projects in countries unmarked by permanent war or conflict. AFRICOM relies heavily on social media to showcase these projects and to portray itself as collaborative with African partners, dedicated to humanitarian aid, and trustworthy in the eyes of local peoples. The command’s Facebook and Twitter accounts are updated daily, and include postings on anything from participation in global humanitarian campaigns such as World Malaria Day (#malariabuzz) to reports on medical missions, sound bites from local recipients of AFRICOM aid, and photos of troops distributing toys to children. Less is said about the expansive presence of American military personnel and technology on the ground and in the skies. 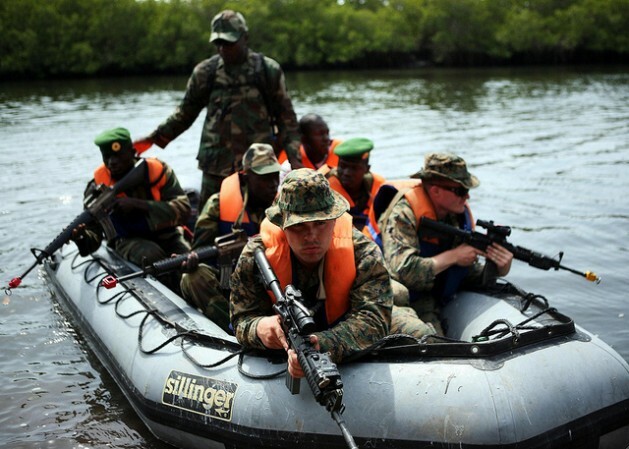 AFRICOM conducts aerial and ground operations with U.S. troops, private military contractors, and proxy African military operatives trained and equipped by the United States. Operation Flintlock is just one of the many training exercises AFRICOM provides for country partners, and Camp Lemonnier in Djibouti is a well-known staging ground for drone strikes in Yemen and Somalia. Not surprisingly, given the ongoing U.S. interest in securing new fuel sources and growing concerns over China’s influence in the region, many of AFRICOM’s efforts are located in oil-rich regions – specifically Kenya, Uganda, Ghana, and the Gulf of Guinea. The Gulf of Guinea, which hugs the Western coast of Africa, has received heightened interest of late given its proximity to the Sahel and Mali, an alleged increase in pirating, and notably, both on- and off-shore oil deposits. In Takoradi, Ghana, for example – a place affectionately nicknamed “Oil City” -AFRICOM trains Ghanaian troops, conducts humanitarian missions, and meets with local chiefs, NGOs, and fishing communities. Of course, wary of lingering skepticism about U.S. motives in Iraq, spokesmen have attempted to distance the United States from any interest in the region’s oil. One need not look far – from the polluted waters of Nigeria’s Niger Delta to Equatorial Guinea’s inequitable oil-driven development – to see how egregiously false that claim is. AFRICOM is insistent that its end-goal is to empower local forces to find African solutions to African problems. But its daily operations and talk of “sensitising” West African nations to the idea of a permanent Marines “crisis unit” in the region make clear that a more permanent U.S. presence on the continent is its true intention. Humanitarian projects allow military personnel to train in new environments, gather local experience and tactical data, and build diplomatic relations with host countries and communities. As activists with Women for Genuine Security have explained, this use of relief and humanitarian aid to “further larger geopolitical and military goals” – a practice they have dubbed “disaster militarism” – is a general strategy employed by the U.S. military worldwide. Similarly, as David Vine has shown with regard to the U.S. military’s “lily pad strategy” of speckling the globe with tiny military installations – much like AFRICOM’s “small-footprint operations” – small-scale troop build-ups allow the United States to establish “goodwill” with local communities, planting the seeds for larger concentrations of troops and activities later on. Accordingly, while humanitarian missions may incur small-scale benefits, these projects ought to be carefully monitored and scrutinised. We should approach AFRICOM’s humanitarian undertakings not as gestures of goodwill or conflict-deterrence, but rather as signs of what’s to come for the militarised U.S. approach to foreign policy in Africa. Joeva Rock is a graduate student in the Department of Anthropology at American University in Washington, DC focusing on colonial legacies in West Africa. Follow her on Twitter: @southsidetrees. This op-ed was originally published by Foreign Policy in Focus.